I just realized that I haven’t posted a recipe for quite some time. It’s good to be back in the kitchen. This was part of the lunch I prepared for friends visiting from Turkey. It was the first time I tried the recipe, but it won’t be the last. It was delicious! It’s a perfect gluten-free recipe that unfortunately won’t work for my whole family. One of my daughters (formerly a quinoa enthusiast) has developed an allergy to quinoa. Who knew? This salad can be served warm or at room temperature – perfect for warm weather dining. Add quinoa to a large saucepan of well-salted boiling water and cook 10 minutes. Drain in sieve and rinse under cold water. Set sieve in a saucepan with 1 1/2” water. Steam quinoa, covered, over medium heat, until fluffy and dry, about 10 minutes. While quinoa is cooking, stir shallot in a large bowl with vinegar and 1/2 tsp. salt and marinate 15 minutes. Whisk in mustard, then oil. 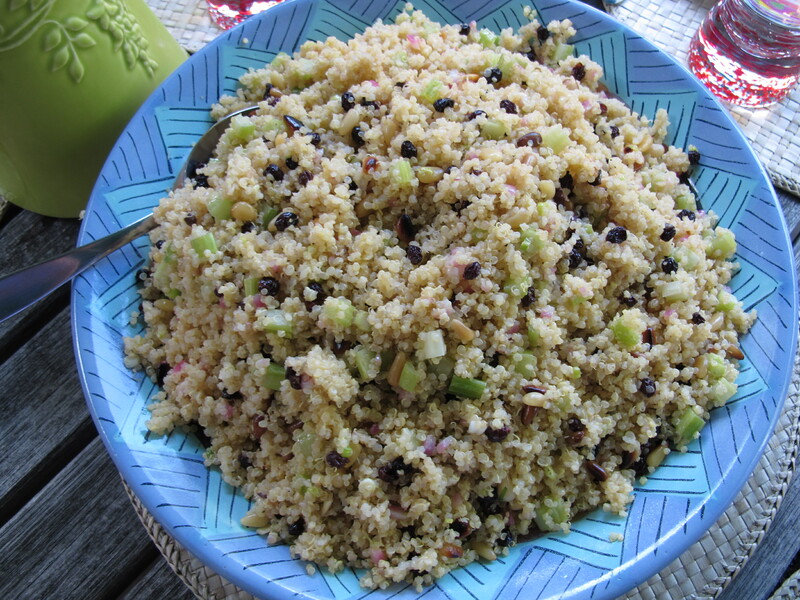 Add hot quinoa, currants, celery, scallions and nuts to dressing and toss well. Season with salt and pepper. I substituted red onion for the shallots because I missed them on my grocery list. With either one I think they pickle slightly while marinating in the vinegar. This salad was a hit and the best part is that we didn’t eat it all. Guess what I had for lunch the next day! This recipe is from Gourmet Easy Dinners magazine. I’m so pleased. If you do make it, let me know what you think. I haven’t used quinoa that much so perhaps I’m easily impressed. Now I crave quinoa. That dish looks scrumptious! I just love quinoa, any way it is served up! This looks delicious! Thanks. Hope you give it a try.